Freeborn, Jeremy. "Canada at the 2018 Olympic Winter Games". The Canadian Encyclopedia, 13 June 2018, Historica Canada. https://www.thecanadianencyclopedia.ca/en/article/canada-at-the-2018-olympic-winter-games. Accessed 20 April 2019. The 2018 Olympic Winter Games were held in PyeongChang, South Korea, from 8 to 25 February 2018. 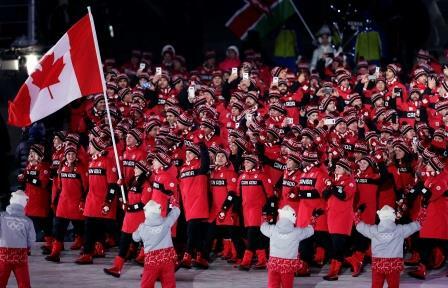 Canada sent 225 athletes (122 men and 103 women) and finished third in the overall medal count with 29 medals (11 gold, 8 silver and 10 bronze). It was Canada’s highest medal total at a single Olympic Winter Games. The Canadian team won 29 medals in nine different sports, including seven medals in freestyle skiing and its first medals in luge (bronze in women’s singles and silver in the team mixed relay). Canadian figure skaters won four medals at the 2018 Games, including ice dancing champions Tessa Virtue and Scott Moir, who became the most decorated figure skaters in Olympic history with five career medals in total. Moir and speed skater Charles Hamelin also tied the Canadian record for most career Olympic medals by a male athlete. Despite the fact that North and South Korea were still technically at war (see Korean War), athletes from both countries marched together during the opening ceremonies under the unification flag. They also fielded a joint women’s hockey team during the Games (coached by Canadian Sarah Murray), while Kim Yo Jong, sister of North Korean leader Kim Jong Un, attended the Games as part of a North Korean delegation. This cooperation between the two countries was particularly noteworthy given the acceleration of the North Korean nuclear missile program and increasing tensions between North Korea and the United States prior to the Games. Four new events debuted at the 2018 Olympic Winter Games in PyeongChang: mixed doubles curling, mixed team alpine skiing, mass start speed skating and big air snowboarding. 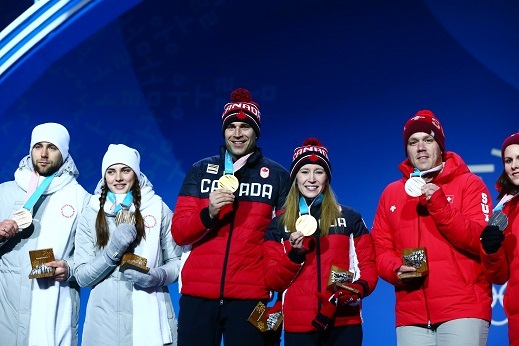 Team Canada won two gold medals in these new sports, Kaitlyn Lawes and John Morris in mixed doubles curling and Sébastien Toutant in men’s big air snowboarding. Tessa Virtue and Scott Moir lead Team Canada into the stadium during the Opening Ceremony of the 2018 Olympic Winter Games in Pyeongchang, South Korea. Team Canada had its best ever Olympics in snowboarding at the 2018 Games in PyeongChang. The Canadian team collected a national record of four medals, breaking the previous record of three medals at the 2010 Games in Vancouver. In men’s slopestyle snowboarding, Canadian Max Parrot won silver, while his teammate Mark McMorris won bronze. Parrot and McMorris were Canada’s first two medalists at the 2018 Olympic Winter Games. It was McMorris’s second straight Olympic medal in the event after winning bronze at the 2014 Olympic Winter Games in Sochi. Laurie Blouin took silver in the women’s competition, becoming the first Canadian to win an Olympic medal in women’s slopestyle snowboarding. In men’s big air snowboarding, which made its debut at the 2018 Games, Sébastian Toutant won the Olympic gold medal. It was an historic victory, as it was Canada’s 500th medal in the history of the Olympic Games. Men's snowboard slopestyle gold medalist Redmond Gerard stands with Team Canada's Max Parrot, silver medalist, and Mark McMorris, bronze medalist, at the Olympic Stadium Plaza during the 2018 Olympic Winter Games in PyeongChang, South Korea. For the second consecutive Olympic Winter Games, Canada led all nations in freestyle skiing medals. 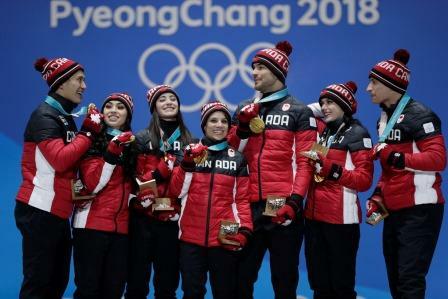 After earning nine medals at the 2014 Olympic Winter Games in Sochi, Team Canada won seven medals at the 2018 Olympic Winter Games in PyeongChang. Team Canada men's freestyle moguls athlete Mikae\u0308l Kingsbury receives his gold medal at the 2018 Olympic Winter Games in Pyeongchang, South Korea, 12 February 2018. In men’s moguls, Mikaël Kingsbury won gold, improving from his silver medal at the 2014 Olympic Winter Games in Sochi. 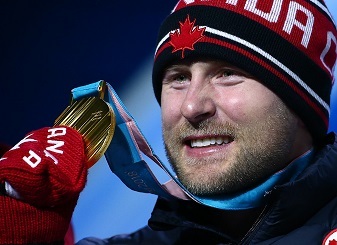 The gold medal came as no surprise, as Kingsbury had dominated the World Cup circuit leading up to PyeongChang. In women’s moguls, Justine Dufour-Lapointe, who had won gold at Sochi in 2014, took silver. Justine Dufour-Lapointe, who had won gold at Sochi in 2014, took silver in women's moguls at the 2018 Olympic Winter Games in PyeongChang. In women’s ski cross, Kelsey Serwa and Brittany Phelan won gold and silver, respectively. It was the third consecutive Olympic championship for Canada in the event (Ashleigh McIvor won in 2010 and Marielle Thompson won in 2014) and the second time Canada won both gold and silver (Serwa won silver in 2014, after Thompson). Meanwhile, Brady Leman won gold in men’s ski cross, becoming the first Canadian man to earn an Olympic medal in the sport. In women’s half-pipe skiing, Cassie Sharpe also won gold, setting an Olympic record with a score of 95.8 points and successfully executing back-to-back 900s and a cork 1080 in her second run. In men’s slopestyle skiing, Alex Beaulieu-Marchand had a personal best of 92.4 points to win Olympic bronze. 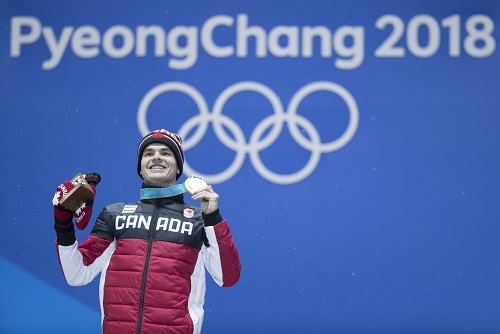 Alex Beaulieu-Marchand of Canada receives the bronze medal for finishing in third position in the men's ski slopestyle final during the Olympic Winter Games in PyeongChang, South Korea on 18 February 2018. Heading into the 2018 Olympic Winter Games, Canada was a strong medal contender in all five Olympic figure skating events. The Canadian figure skaters came away with four medals, the most ever by Canada in figure skating at a single Olympic Winter Games. In the team event, the Canadian team of Patrick Chan (men’s singles), Gabrielle Daleman and Kaetlyn Osmond (women’s singles), Meagan Duhamel and Eric Radford (pairs) and Tessa Virtue and Scott Moir (ice dance) won gold, improving upon their silver in the event’s debut at the 2014 Olympic Winter Games in Sochi. The Canadian figure skating team celebrates its gold medal in the team event at the 2018 Olympic Winter Games in PyeongChang. Virtue and Moir set a world record for most total points in an ice dancing competition with 206.07, winning the gold medal. They became the first figure skaters ever to win five Olympic medals, while Moir tied a Canadian record for most medals won by a male athlete in the history of the Olympic Games. Duhamel and Radford won the bronze medal in pairs competition, and Osmond won bronze in women’s singles. In long track speed skating, the Canadian star was Ted-Jan Bloemen. A native of Leiderdorp in the Netherlands, Bloemen was eligible for Canadian citizenship because his father had been born in Bathurst, New Brunswick. Making his Olympic debut at the age of 31, Bloemen won silver in the men’s 5000m and gold in the men’s 10,000m, setting an Olympic record with a time of 12:39.77. Bloemen was the first Canadian to win a medal in the men’s 10,000m since Frank Stack won the bronze medal at the 1932 Olympic Winter Games in Lake Placid. 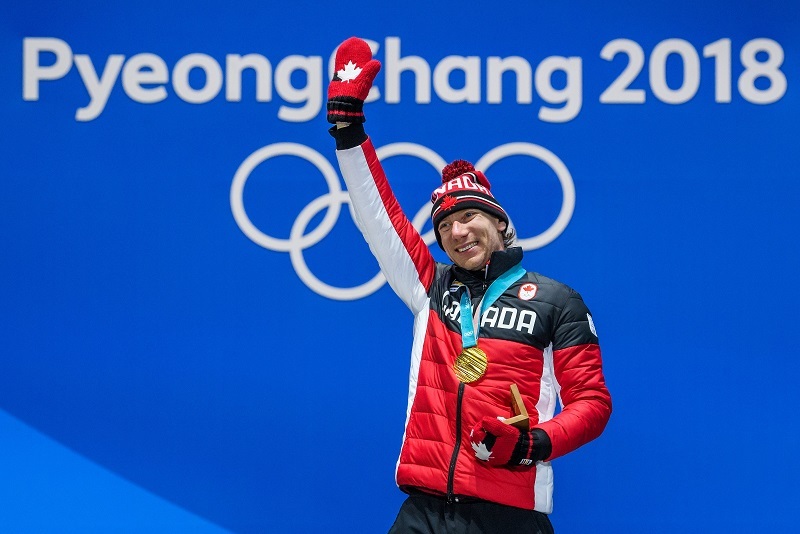 Ted-Jan Bloeman of Canada receives the gold medal for the men's 10,000m final at the PyeongChang Olympic Plaza during the PyeonChang Olympic Winter Games in Gangneung, South Korea on 16 February 2018. In short track speed skating, Kim Boutin became the second skater ever to win three individual medals at a single Olympic Winter Games (the first was Wang Meng of China at the 2006 Olympic Winter Games in Torino). Her first medal was a bronze in the women’s 500m, which was awarded after Choi Min-jeong of South Korea was disqualified for interference — a ruling that prompted online death threats against Boutin. Despite the threats, Boutin went on to win another bronze in the 1500m and silver in the 1000m. The Canadian Olympic Committee recognized Boutin’s ability and perseverance by naming her flag bearer in the closing ceremonies. 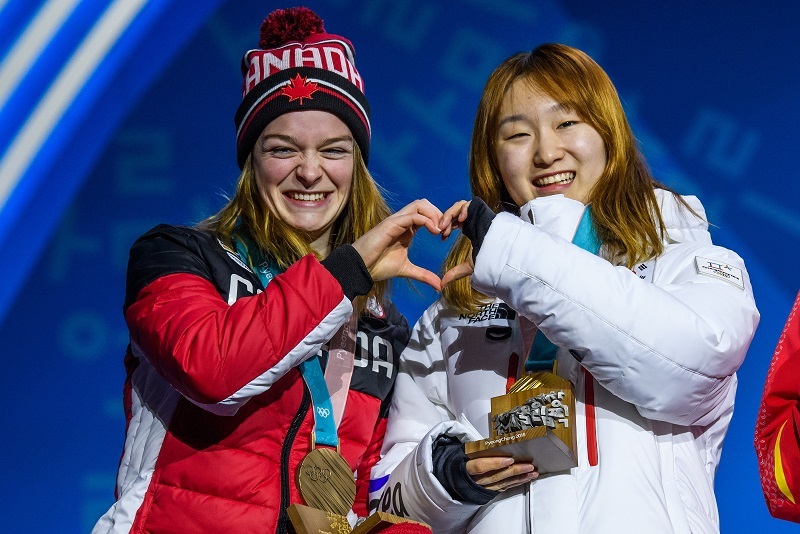 Kim Boutin of Canada receives the bronze medal in the Short Track Speed Skating Women's 1500m final at the 2018 PyeongChang Olympic Winter Games on 18 February 2018. Team Canada won two more short track speed skating medals. Samuel Girard became the first Canadian to win Olympic gold in the men’s 1000m event and later was part of the Canadian team that won bronze in the men’s 5000m relay. Also on the relay team was Charles Hamelin, who won his fifth short track speed skating medal and tied the Canadian record for most career Olympic medals by a male athlete. For the first time in Olympic history, Canada won medals in luge. Alex Gough won bronze in women’s luge and then teamed up with Sam Edney, Justin Snith and Tristan Walker to win silver in the mixed doubles relay. Brady Leman won gold in men's ski cross at the 2018 Olympic Winter Games in PyeongChang, becoming the first Canadian man to earn an Olympic medal in the sport. In bobsled, Canada won two medals. As at the 1998 Olympic Winter Games in Nagano, when Pierre Lueders and Dave MacEachern tied for first place with Italy, the Canadian team of Justin Kripps and Alex Kopacz shared the gold medal in the men’s two-man bobsled with Germany. 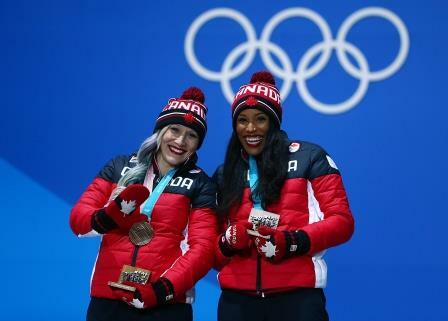 In women’s bobsled, Kaillie Humphries won bronze, her third consecutive Olympic medal in the sport. Her brakewoman at the 2018 Games was Phylicia George, an Olympic sprinter and hurdler. Canadians Kaitlyn Lawes and John Morris won gold in mixed doubles curling, which debuted at the 2018 Olympic Winter Games in PyeongChang. In mixed doubles, each nation was represented by one man and one woman per team, and games were eight ends rather than the 10 ends of traditional four-person curling. Canada lost 9–6 in their opening game to Norway but were undefeated the rest of the tournament, winning the remaining six round robin games before getting revenge against Norway in a 8–4 win in the semifinals and then beating reigning world champion Switzerland 10–3 in the gold medal game. Canadians Kaitlyn Lawes and John Morris won gold in mixed doubles curling, which debuted at the 2018 Olympic Winter Games in PyeongChang. For the first time in Olympic history, Canada did not earn a medal in either men’s or women’s curling. In men’s curling, Canada, skipped by Kevin Koe, lost 7–5 to Switzerland in the bronze medal game. In women’s curling, the Canadian team, skipped by Rachel Homan, had a round robin record of four wins and five losses and missed the playoffs altogether. For the first time since the 1998 Olympic Winter Games in Nagano, Team Canada did not win Olympic gold in hockey; the women’s hockey team won silver and the men’s hockey team won bronze. 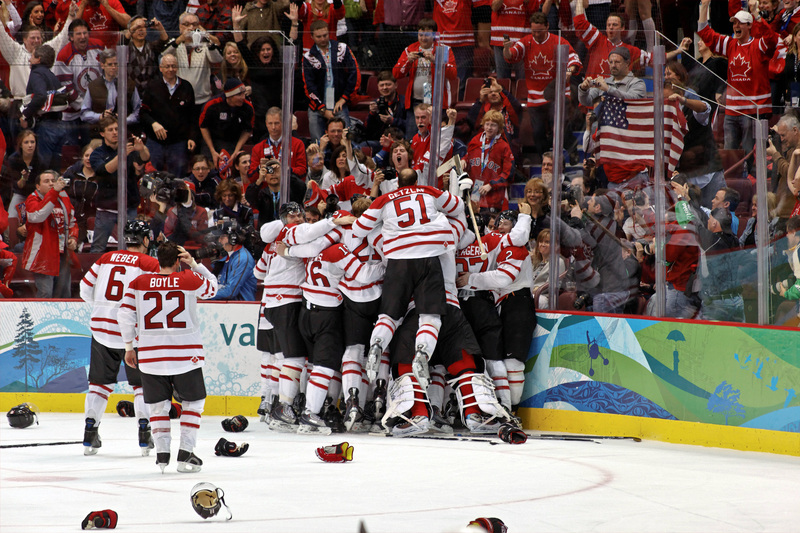 In women’s hockey, Team Canada went undefeated until the gold medal game but lost to the United States 3–2 in a shootout. It was the first time since the 1998 Olympic Winter Games in Nagano that Team Canada did not win gold in women’s hockey. 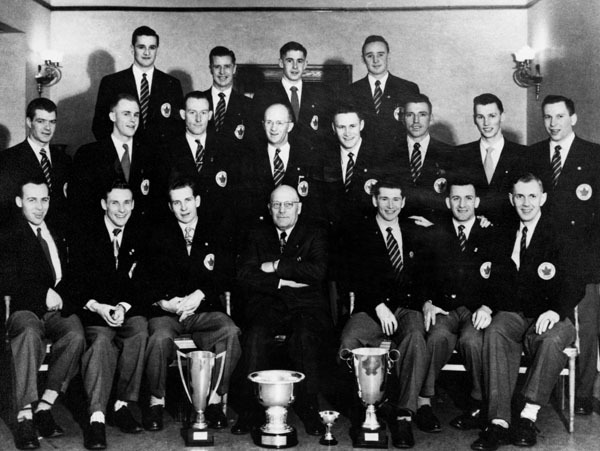 In men’s hockey, teams were unable to use National Hockey League players. The 2018 Winter Games were the first since 1994 in which NHL players did not participate. NHL Commissioner Gary Bettman argued that Olympic participation in men’s hockey was too disruptive to the NHL’s regular season, even though the National Hockey Players’ Association was “extraordinarily disappointed and adamantly disagreed with the NHL’s shortsighted decision” not to compete in PyeongChang.